Three farm fresh cage-free eggs cooked any style and your choice of ham, bacon, sausage, chorizo, pulled pork, chicken sausage or soyrizo. Includes hash browns and choice of toast. Farm fresh cage-free eggs with a choice of three fillings served with hash browns and choice of toast or tortillas. 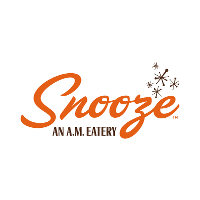 Snooze’s homemade rosemary sausage gravy smothers a flaky puff pastry, topped with an egg your style we’d say sunny side up. You’ve reached breakfast bliss, complete with hash browns. Snooze’s signature shredded hash mixed with artisan corned beef, caramelized poblanos and onions. Topped with two cage-free eggs your style & toast or tortillas. Three fresh corn or flour tortillas topped with scrambled eggs, shredded hash browns, jack cheese, green chili hollandaise & pico de gallo - inside tip: better yet with veggie/meat toppings. Filled with scrambled eggs, hash browns, house black beans, cheddar & jack cheese, topped with pico de gallo and choice of green chili or ranchero, psst, love your veggies & meats. Corn or flour tortillas layered with black beans, jack cheese, ranchero sauce, three cage-free eggs any style, and pico de gallo. The classic evolved with our signature English muffin topped with shaved tender belly ham, perfectly poached cage-free eggs, and smoked cheddar hollandaise. Lox-style salmon and cream cheese served over toasted rye and topped with poached cage-free eggs, cream cheese hollandaise and sun-dried tomato and caper relish. Thin slices of prosciutto, Taleggio cheese, and perfectly poached eggs on toasted ciabatta, topped with cream cheese hollandaise, balsamic glaze, and arugula. Ciao Bella. Slow cooked pulled pork over a stack of green chile sauced tortillas and melted cheese with poached cage-free eggs, green chili hollandaise, pico de gallo and cotija cheese. Can’t decide. Choose half an order of your two favorite benedict offerings. Buttermilk pancakes with caramelized pineapple chunks, housemade vanilla crème anglaise, and cinnamon butter. Our signature sweet potato buttermilk pancakes topped with homemade caramel, candied pecans, and ginger butter. Buttermilk pancakes topped with blueberry coulis, sweet cream and almond streusel surrounding a center of lemony cream cheese filling. Plain, blueberry, chocolate chip, or peanut butter cup. Choose any three pancake flavors from above and get the best of all worlds. Fresh brioche stuffed with mascarpone and topped with vanilla crème, salted caramel, fresh strawberries, and toasted coconut. For the purist, French toasted brioche completed with whipped mascarpone cream, seasonal fruit, and Slopeside pure Vermont maple syrup. A soft pretzel roll filled with scrambled cage-free eggs, cheddar cheese and a sausage patty, served with a side of smoked cheddar hollandaise. Free-range house pork, shaved ham, Swiss cheese, homemade pickles, and a sunny side egg or your call with Dijon and hollandaise, served up open-face on a ciabatta roll. Tender belly bacon, fried cage-free egg - we recommend sunny side up, organic arugula and sliced tomato served with bacon-tomato aioli on a toasted ciabatta roll. Mounds of artisan corned beef, sauerkraut, and Swiss cheese with house 1,000 isles dressing upon a plump pretzel roll. A work of art. Cage-free egg whites filled with wild mushrooms, roasted sweet potatoes, poblano peppers, and leeks, topped with dressed arugula, shaved Manchego, spiced pepitas and cherry tomatoes. Cage-free egg whites cooked to your liking with your choice of three fillings served with hash browns and choice of toast or tortillas.